← My Goodies for You! We’re going on a Fiber Hunt! Okay…are you ready? Do you have those typing fingers poised over the keys to do some lightning quick fiber searching?? Each link is worth an entry in the 6 drawings! The items can be found anywhere and everywhere…I think this will be a really fun interactive kind of game that all of us can share in together, as we see what fibery goodness everyone else is finding! Who knows? We may be really surprised at what we find…or be super inspired to whip up something brand new and amazing! So…what are you waiting for??? Happy Hunting! This entry was posted in Blogiversary, Contests, Crafting, Crochet, Knitting, Loom Knitting. Bookmark the permalink. 174 Responses to We’re going on a Fiber Hunt! 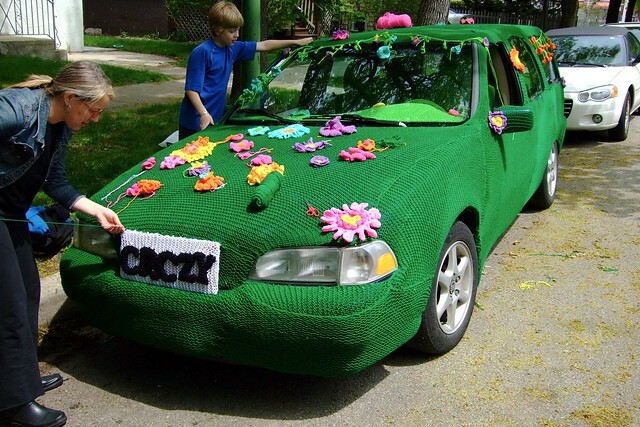 #3 Most Intricately Knitted Item. I just love this, would be hard to loom knit. Wow, Kelly! That is indeed VERY interesting…and how colorful! What an excellent community project. Kelly, I’m getting ready to start that girasole on needles. I have it ready in a bag. It will be my bonus when this craft room is cleaned up. My reward. Jeanette, this would be a very wonderful incentive to get the job done…I bet you just can’t wait! 1. most colorful bag- I like your Easter basket bag Bethany. It is very colorful. I also like Noro yarn used for color in bags. I have some of that too for the future. Weeeeelllll…I’m sorry to say that so far I haven’t had much practice (or luck, lol!) on lace items. I haven’t had the time to just sit down and do any of those LAL that have gone through this skill…someday, though…I am determined! 😛 I tried the beautiful lace dishcloth from the Loomers Classroom and just couldn’t get it to work for me. I figured I wasn’t up to that level yet and set it aside for now, lol. Oh, I have to say, I really love my Easter Basket Bag, lol! the colors and the yummy felt make me happy. 😀 I haven’t used Noro yarns yet…I’ve heard a lot about them, though…I should get some and try it! Just had to post this link I just came across – neat projects!!! I may have to figure out some of these for the looms. Jeannette…do you have a link for those cute critters?? OMGoodness, Kelly…those critters are just too sweet! I was literally mesmerized just looking…the animation kind of added to that affect, lol! I LOVE the chicken and the egg one…very clever! Bethaney – when you get time take a look at the critters under the blog section too. amazing! This is the tiniest knitting I know of. Althea Crome knits intarsia on pins for tiny models. The details are extreme. Are you hiding the links Bethany? my last two aren’t on the post. Here is #3. She even knits tiny socks with details in them, she knits with thread on pins. It’s adapted from a needle project and I couldn’r rest until I figured out how to loom it. How do I get the links to show?? I usually just put the arrows before and after but they are hiding on here. I love the mochi-mochi land stuff. I sent Helen J to that site and her son loom knitted the toilet paper scarf. It turned out cute too. I want to make the snake swallowing the mouse. Kelly, that is a very bright bag, but oh so cute…love the wiggly eyes! wow jeannette – i can’t believe the detail – amazing!! Here are some neat felted critters. Can ya’all tell I’m a Doctor Who fan, lol. Pity the BBC made the designer take the pattern down. Ya..Kelly, I think I agree with you on that one! I posted a video link sometime back showing a lady knitting with cat hair, I think…I listed it under “spooky things” so you know how I feel about that one, lol! Jeannette, those critter are simply wonderful! Love their softy goodness…thanks so much for that link! Kelly, wouldn’t that dog hair make you sneeze? Also, when it is wet would you smell like your dog? I heard of someone who had a sweater made of wolf fur and when it was delivered her dog tore it to shreds. Yuck!!! Kate, that’s really cute, too…even contraversial, lol. I haven’t ever watched Dr. Who, so I’m not familiar with these characters, but they sure are quirky-cute! There’s a footstool cover knitted from yarn made out of newspaper. I’m having too much fun on this scavenger hunt. The house is falling apart; the children are being absorbed by the wii. Yet here I sit, mindlessly searching the internet for interest bits of dibercraft! Kate, that’s really quite ingenious! I wonder if you made upholstery out of that type of “yarn” if you’d end up with ink on your clothes?? 😉 I really like the floor mat, though…but for INSIDE the house, rather than out, lol! I know what you mean Kate. My house is a wreck too and my 2 year old is in his bed hollaring instead of sleeping. I just pipe up with a go to bed every now and then. I don’t know. I’ve got cats. That footstool looks like a giat scratching post to me. Kate that is too fun! Who thinks up these things??? Love the your Fiber Art choice! well…i’m down to favorite project…I don’t have a finished project link on this one – I’ve been working on a design for a “Trains, Planes, Automobiles” twin size comforter for my sons bed. It’s a double knit intarsia design pieced together in LOTS of blocks. I have the design finished, just don’t have it knit up yet. It’s been a labor of love for my little guy. He’ll be moving to a big boy bed soon. Kelly, I like that project. It may take a while but be cherished and remembered forever. Don’t forget taking many pictures of it, they seal the remembrance in print. Plus, we would love to see it too. I remember when you first posted that. Thanks Jeannette. I just got the last couple designs figured out (a wagon and helicopter!). I’ll have a pattern posted when i’m done. Probably will post it for sale, it’s a lot of work and designs. This bike is knitted with wire!! How cool is that? 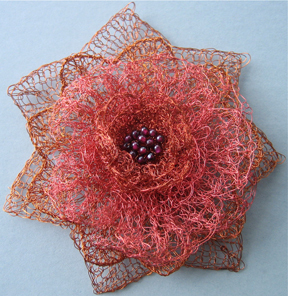 I like wire with beads for the jewelry and this shows you can do so much more. That sounds really wonderful, Kelly! I agree with Jeannette…take tons of pics so you’ll remember and cherish the time always, especially since it is a labor of love. ❤ I made a quilt (very basic, but really cute) for my eldest daughter when she turned 6 (she's now 17!). She still loves and uses that blanket every night…I've cuddled under it, and it just seems to feel better than most other blankets…no reason for it, except all the love sewn inside. 🙂 I need to do one for my younger daughter, as I got really busy with other things and never got around to doing her one…soon! I am missing the scavenger hunt…. How about knitting in Gold?? I need this- my husband would even like the geometric shape, he is constantly making this out of paper clips, should I ask for one in gold??? Carol, read the above and enjoy the links, then join in. You aren’t missing it yet. Jenny, you’re right! This little guy is SO adorable…and functional besides, lol! Oh well, if I was looking for stuff right now, I would not be doing my LAL!! Don’t worry Carol. I actually stopped working on my LAL to do this (hehe). i’m picking it back up now to finish my wedges. Those things are a little like magic, aren’t they, lol? I really felt like I was sculpting in a way when I was figuring those babies out…it was a very interesting experience. 🙂 I still love wearing them! Bethany – I LOVE the story!!! That is such a neat idea. Wonderful writers too! This is just too much fun everybody! I’ve been completely mesmerized right here at the computer, letting everything else just handle itself, lol! BUT…my stomach is calling me…I’m starving! I’ll just go grab a quick snack and be right back. Keep up with the fun, though…it’s been excellent! You’re right…we have a whole lot of very good writers hanging out in our loomy groups, lol! #6. This is very hard. I have to go back and think of everything I’ve loomed. Hmmm, I had the most fun with the snowballs ( http://www.ravelry.com/projects/jpirkle/summer-time-snowballs ) but that is actually a cast on, my favorite by far from Brenda in Georgia. The gathered cast on, I use it a bunch for so much stuff. 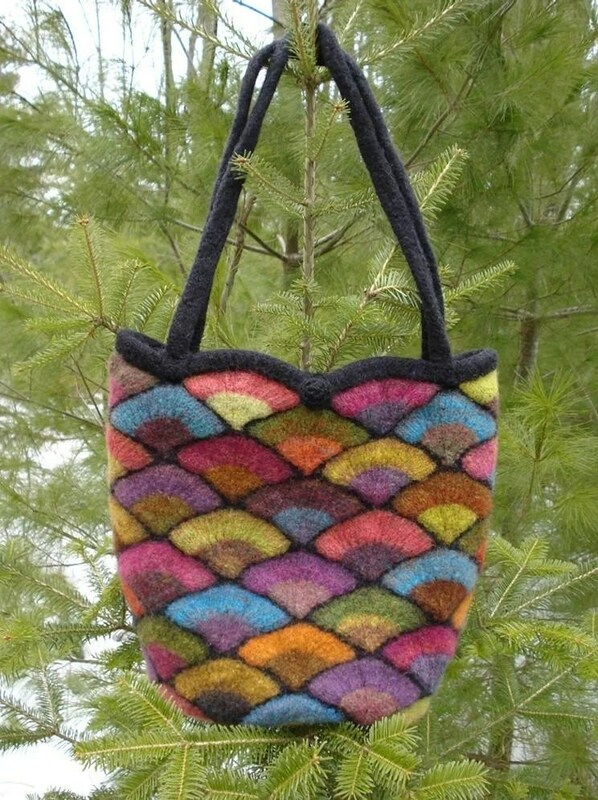 I used my fabric loom knit purse the most. I finally retired it a month ago. It was just a bit to bright for me after all that time. I used it for almost a year. wow – i may have to make that bag! Okay…I am in love with that monkey…right now…need some monkey love, lol! So cute, Pam! I’ll go save you, Jenny…never fear! I might have to agree with you on that one, Jenny. Those socks are absolutely stunning! You did a very professional job on those, and in such a short time, too. Bethany, thanks for saving me 😉 And thanks for all the fun! It’s been super hanging out with everyone and seeing some fun things. I have to go make a grocery list – I get to drag all four of the kiddos to the store tonight 😛 I’ll check in again later. Hugs! Ha, one more 🙂 You did a bang up job on your socks too, Bethany. Love them 1,000,000 ❤ Hugs! I am going to have to pass on the scavenger hunt. Just spent 3 hours on the scrubby so need to get busy around the house. I will come back later when I have time and read all the links. thanks for a fun time, Bethany. Keggy, I like that tree too. I also like the wind powered sock knitter and the cranes knitting with telephone polls. I also like the fireman Brenda made. Maybe even better than the Leprechaun. Keggy, that is why I got some Noro silk garden, I love all the colors in it. I just got it so I have to start that soon too. Hmmm, more UFO’s or will I actually ever get caught up?? Nah! !Who wants to, I’m having to much fun with all of this.Great therapy too. Now we need a giant carrot!!!! Keggy, that is absolutely adorable! I don’t think you’d have to needle knit him, either…he looks doable on the looms, don’t you think? #3…Intracate knitting…I think this is just beautiful!!!!! Keggy, that is absolutely stunning! 🙂 It looks a little like that spun gold from earlier, don’t you think? Only waaaay more delicate. Thanks for pointing that one out! Keggy, that’s pretty cool looking…do you have an original post link so we can have all the juicy details?? Bethany, you are to funny also, I laughed when you said that bunny was doable on the looms. I bet you could if you used the infinity or in panels. Are you starting one for your backyard? Helen said a while back they are knitting a ship with all the parts in England for next year. That will be cool. Dora, I believe, is at Y2KHippie and blogs about her ranch life, etc. She has some fibery things every once in a while. Pam, that is pure loveliness. 🙂 The interesting thing is that I was just on the elann site looking around…I mean JUST on! I would love to be able to do this. This would have to be my Little Bow/Butterfly Bonnet that I loom knitted guessing as I went along not really knowing what I was doing lol, but it turned out perfect and I was very pleased and proud of my accomplishment. You can see it on my blog under free patterns. Pam, that silver shawl is beautiful. I like the bracelets with pearls too. You should be proud of something you made yourself and it turned out just right. That is all we are aiming for in life after all isn’t it? What is the link to your blog? Thanks Jeannette here is the link to my blog. Haven’t done much on it for a while, other aspects of life seem to have gotten in the way lately but hopefully will be able to update it soon. Pam, I really love your sweet little Bow/Butterfly Bonnet! You did a wonderful job on that…it’s so amazing when you’re not sure how to create something that you have in your mind’s eye, and yet it practically flows from your loom like magic…I love that! 🙂 You should be very pleased. These are some colorful bags. Sorry I started late. Baby is sleeping. These are some cute critters. Now this is to wierd. I don’t know I love them all and want to make everything. If I had to pick one it would be the fan and feather lace pattern but it is one of mine in curtains, pocket book, edging on tops, pillow covers etc…. I am doing a pillow cover now full size. I don’t know how to put a photo in here. I can post it on my blog tomorrow hopefully. Thank you Bethany for a great blog party. If I ever have one you will be invited. You all will. Oh my there are soo many good things to choose from in all these catagories! The one I knit from a 123 year old loom knitting book! It gets both the crocheters and the knitters heads turning! 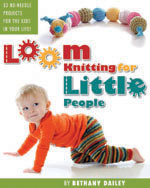 And then I get to tell them it is loom knit! For most intricate.. I came across this last night! Beautiful! I have not really dont any fair isle it eludes me but I have a remedy.. our knitting guild is going to have a workshop on it!! It pays to be the guild president some times! Stitching Up the National Gallery of Art! My peice is in there SOMEWHERE! I love that wrap, Denise! It looks so fuzzy and cozy…much like green chenille caterpillars, lol! I hope you’re still working on that old book…I really want to read a copy…seriously…please hurry! 😉 I love old antique books, and what could be better than looming one?? Marcie, this sounds really intriguing! I hope you do post, because I’m really interested in seeing this-sounds great! #3 Another intricate…I love this!! #5 Items Knitted in Elements Other Than Yarn – some of these are fantastic designs…I have never seen the wire done like this!! There are WAY too many here…..but I LOVE all the socks I have seen, from Bethany’s to Isela’s to the ones Jill made from Isela’s patterns. there is just something about socks!! And if socks are your passion, just you wait ’till you get your hands on that new book of Isela’s! You’ll be looming socks for a lifetime once you’ve gotten just a tiny taste of what’s inside. 🙂 Thanks for playing, Carol! Most Intricately Knitted Item – Fall is just around the corner. Your Absolute All-Time Favorite Loom Knitted Project (could be one you’ve knitted/designed yourself, or one you’ve spotted) – My Designed Loom Knit Bunny Baby Security Blanket. Kittyred, the intricate scarf is very pretty Scarlett, good use of color too. Be sure and check out the other items on this site. I’m currently designing a little kokeshi doll using the two peg knitting technique. Thanks Jeannette – I guess my other post was way too long as I listed all 6 together and it’s waiting approval by Bethany. I designed and made this for my grandson before he was born last Dec.